My daughter is in junior kindergarten, and just as her teachers predicted, in February her reading took off. That means we’ve jumped into the deep end with early readers. That’s why we were very excited when the first book in Sleeping Bear Press’ new early reader series arrived at our house. 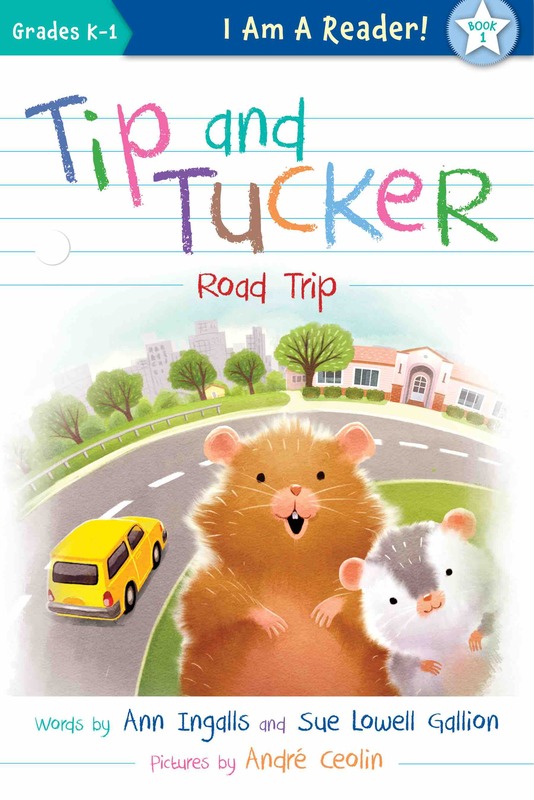 The series follows Tip and Tucker, two hamsters that find a home in a school classroom. The first book, Tip and Tucker Road Trip (written by Ann Ingalls and Sue Lowell Gallion, illustrated by Andre Ceolin) introduces young readers to the two friends. Tucker is brave and Tip tends to get nervous in new situations. That means the two are in for an adventure when Mr. Lopez purchases them from the pet store. Soon the duo is on their way to their new home — a mysterious place called school. Subsequent books in the series are expected to help beginning readers explore new feelings and learn to navigate classroom dynamics and relationships. The second book will release in August. When I sat down with my daughter for a first reading of Tip and Tucker Road Trip she was able to read most of the words on her own. She did struggle with a few trickier words like “Lopez,” “noisy,” “building,” “twitches” and “place” upon first exposure, but otherwise did fine. Her review: “I liked when Tip got brave and when they got to see new things. Tip and Tucker are so cute!” I loved that she couldn’t guess Tip and Tucker’s story — unlike some movie/TV tie-in early readers — and had to sound everything out. As can be the case with early readers, books often have a short shelf life. Luckily Tip and Tucker Road Trip is fairly inexpensive ($4.99 for paperback and $9.99 for hardback). It’s also less than $5 as a kindle book. Based on where we are now with reading, I think my daughter will have moved up to the next reading level by the time the second Tip and Tucker book comes out. But the books are so cute, we may just chance it when the time comes. Download a Tip & Tucker Activity Sheet.